From the depths of the attic comes this clacky relic and perhaps the most meticulously sampled typewriter around. Performance Typewriter includes up to four velocity layers, 10x round-robin, release triggers, and all sorts of carriage returns, paper rips, and other knobs and switches. Yes, it even includes the bell. Available in both free and full versions. When loaded into Kontakt, the full version of Performance Typewriter uses about 22 MB of RAM while the free version uses about 12 MB. The typewriter was sampled meticulously and uses a total of 351 samples. Under the hood, Performance Typewriter is powered by a custom script that provides advanced features like randomized round-robin, release samples, and more. This instrument is only available with 16-bit samples. 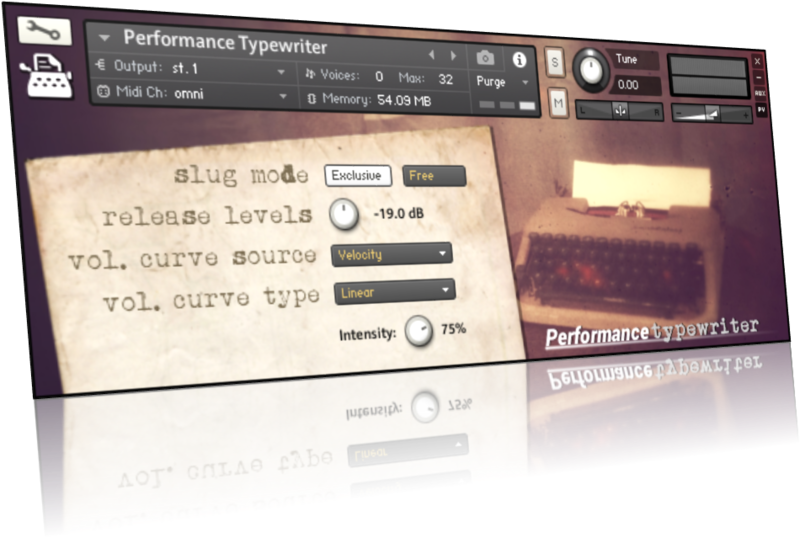 Performance Typewriter requires the full version of Kontakt 5.5. If loaded into Kontakt Player it will only operate in demo mode. This is a restriction imposed by NI, not Performance Typewriter. Performance Typewriter Free is offered free of charge, and may be used for personal and commercial purposes. Carriage returns, paper rips, the feed knob (with and without paper), and various switches are not available in the free version. Performance Typewriter is available at a price of $5 USD, and may be used for personal and commercial purposes. Performance Typewriter is provided without warranty; however, please contact me directly if you have any questions or comments and I will respond as soon as possible.